Who knew the Milky Way was so close? 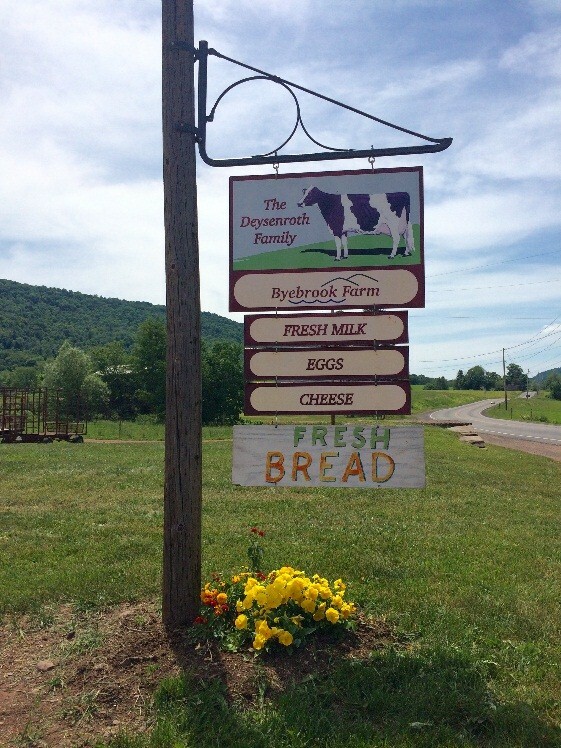 To celebrate National Dairy Month, FaHN AmeriCorps members Maggie and Olivia participated in Catskills Family Creameries’ 4th Annual Milky Way Tour. For one day, six farmstead creameries in the Catskills opened their doors to the public to taste cheese, pet cows and talk to farmers and cheesemakers. 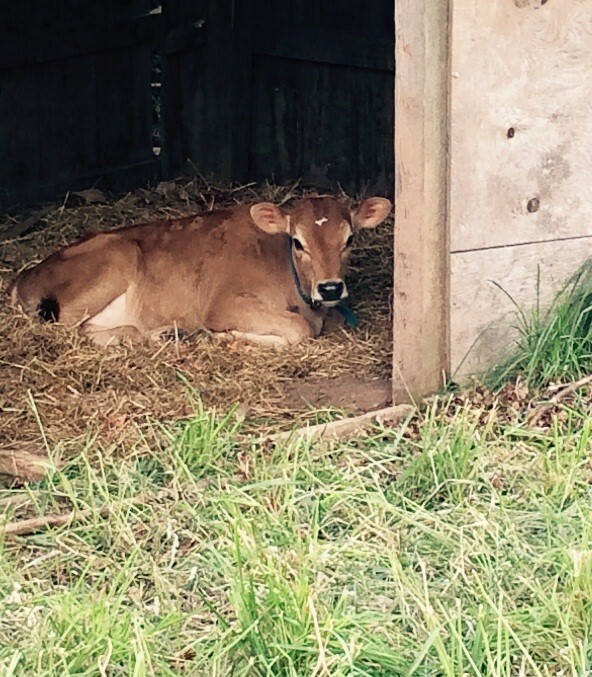 We chose three farms and spent the morning enjoying delicious Delaware County cheeses. 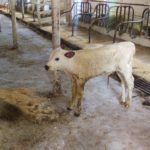 Our first stop was Bovina Valley Farms in Delhi. Farmer and owner Dan Finn gave us a crash course in cheese making and showed us his cheese “cave,” where lots of Alderney, a French-style raw-milk Tomme cheese, was aging. We also got to meet a baby calf who had just been born that morning! 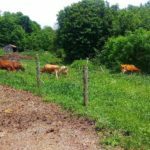 In addition to the delicious cheese, Bovina Valley Farms also produces Moonshine Maple, a small-batch, wood-fired maple syrup, and premium cuts of beef and pork. You can find Bovina Valley Farms products at the farm store, open every day from 8 to 6, as well as in a variety of retail stores and restaurants in the Catskills and New York City. If that’s too far of a drive, you’re in luck! You can also shop on the farm’s website and have delicious food shipped right to your door. 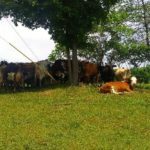 Bovina Valley cows relaxing on a hot day. We headed down the road to Betty Acres Farm, home to Modern Milkmaid cheeses and Bear Mountain Maple. We were greeted by another baby calf. We started out in the sugar house, where we tasted maple syrup, maple candy and maple popcorn. We also got a close look at their evaporator, a huge machine they use to boil sap down into syrup. Then it was time to taste some cheese! All of the cheese is handmade in the farm’s microcreamery using milk from “the girls,” what farmer and owner Aissa O’Neil lovingly calls her cows. 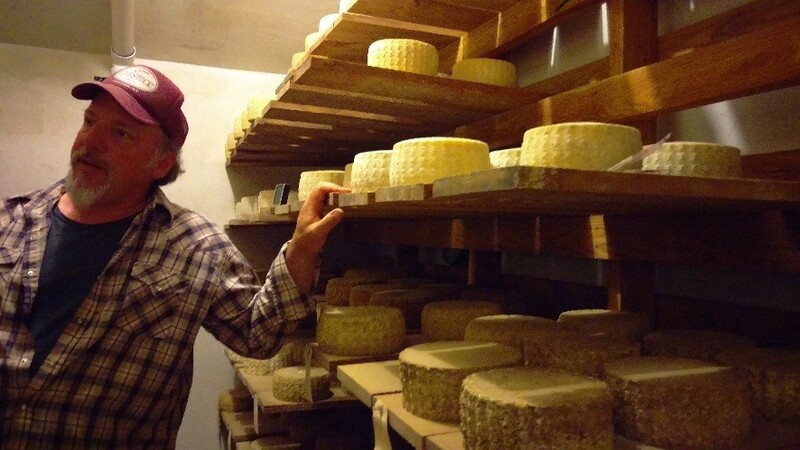 Some of Betty Acres’ cheeses, including a Spanish-inspired “Delchego” and a take on camembert called “Cremembert,” are aged in a hillside cheese cave. The rest of the milk is used to make a fresh, spreadable cheese with mix-ins like pesto and lavender. And it really is fresh: milk goes from cow to cheese within three days. 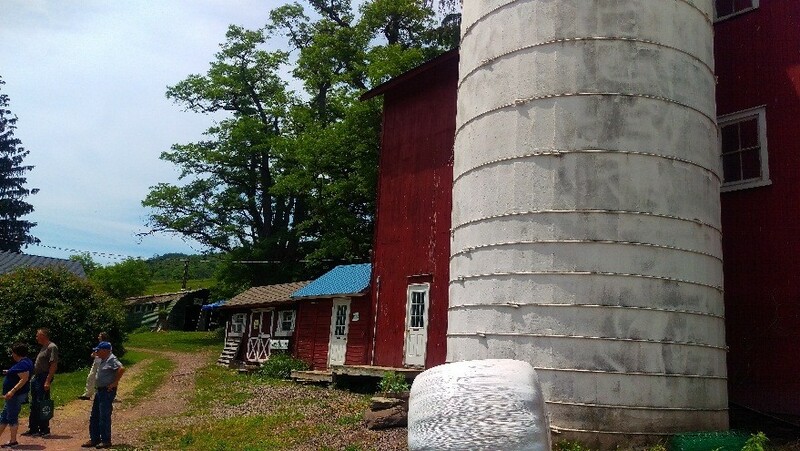 Betty Acres’ barn, farm store and cheesemaking facilities, with the Bear Mountain Maple sugar house in the background. You can find Betty Acres’ products at farmers markets and retail stores in Delaware County, including Freshtown, Good Cheap Food and Delaware Bounty. Our last stop was Byebrook Farm in Bloomville, a 45-cow dairy operation that produces grass-fed raw milk and several varieties of raw-milk Gouda. 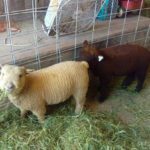 We started in the farm stand, which is small but packed with lots of goodies from Byebrook and other surrounding farms, including eggs, bread, pies, cheeses and yogurt. We tasted three varieties of cheese: a young Gouda, an aged variety that’s washed in hard cider, and a smoked Gouda. And for dessert, there were some fresh baked cookies and milk. After the tastings, we wandered into the barn to see the animals. We hung out with some very affectionate baby calves who couldn’t wait to give us a lick! 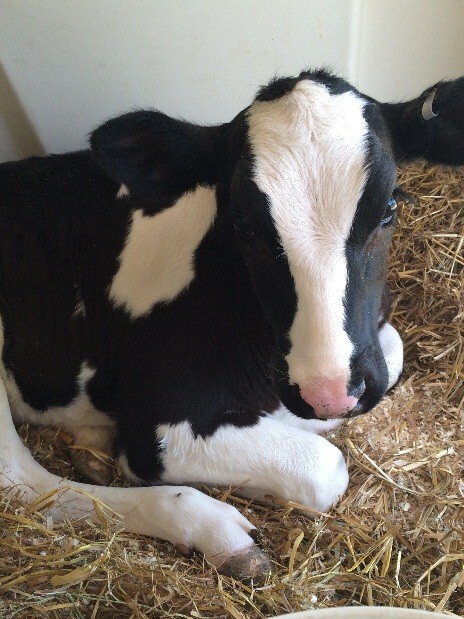 One of the calves at Byebrook Farm. We didn’t get a chance to stop at all six farms, but Cowbella Creamery, Dirty Girl Farm and Hawthorne Valley Farms also have delicious milk, cheeses and yogurts available. On our way back to Binghamton, we stopped at Franklin’s Gone Local Marketplace to get some drinks for the road and browse their local food and gifts. They serve ice cream and sandwiches that looked delicious, too. If you’re in Delaware County, make sure to stop by one of the many farmers’ markets, farm stores and retail stores to pick up some local products.